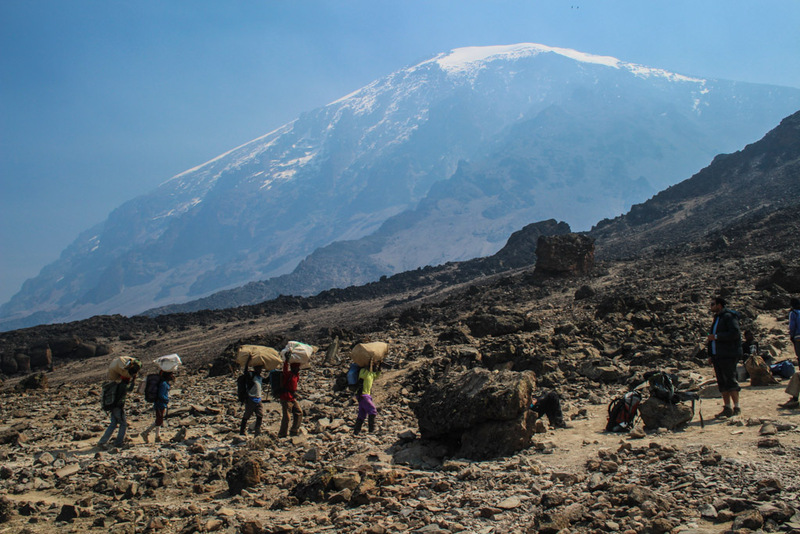 After a liesurely departure from camp we made our way from Karanga to Base Camp under pleasant temperatures. The short, 4-hour hike consisted of a steady march up a boulder-strewn slope, down one valley and then up the other side to camp. Base Camp is a motley collection of tents scattered among lava boulders on a steeply-sloped ridge. While it is reasonably sheltered from the wind, it is generally crowded, especially at midday with the crossover of trekkers preparing to ascend later that night and those who have descended from the summit that morning and are now resting up before continuing further down the mountain. With flat space on Barafu’s narrow ridge at a premium, we had to wait for a group to leave before our porters could set up our tents in the spot they vacated. We took advantage of the pleasant afternoon temperatures to relax outside of our tents, and we passed our time congratulating the hikers who had made it to Uhuru Peak earlier that morning and were now on their way down. On the whole, they appeared to be more exhausted than elated, which was a bit unnerving. We decided not to press them for too much information about the trail ahead—with our summit attempt less than twelve hours away, we adopted the philosophy that ignorance is bliss and tried as hard as we could to dismiss the pained expressions we saw plastered on so many of their faces. Click to enlarge photos and view as a slideshow. Before dinner, we did a little packing to prepare for the summit attempt. Very happy to continue to have your summer news – thanks. Those camps look crazy! I bet it was hard to sleep in those conditions and at that altitude. Your photos really show how barren it is up there. Nice going! Thanks, Andy. You are so right about the sleep. The altitude, the cold and waking up in the night to use the bathroom after drinking all the fluids necessary to combat altitude sickness all conspired against us and made getting a good night’s rest very difficult. And, yes, the landscape was incredibly barren. It was easy to imagine that we were hiking on the moon! It looks like you slept on a bed of rocks!! Yeah, that about sums it up! Our Thermarests were lifesavers!